~Barb is supposed to be a part-time, substitute, mail carrier, but during the summer she has to cover for people on vacation so she works A LOT! This means we don’t get a chance to get together a heck of a lot. The same thing happens from Thanksgiving through Christmas. Hurray! She was off on Wednesday so I went up and spent Tuesday and Wednesday night with her. We had a blast! When I got up to her place Tuesday afternoon, we had a wonderful walk around looking at flowers, birds, butterflies, etc. Took pictures of butterflies and flowers. Some of the flower pictures have already been posted. I brought up a surprise craft project for us to do and she had a surprise project too! 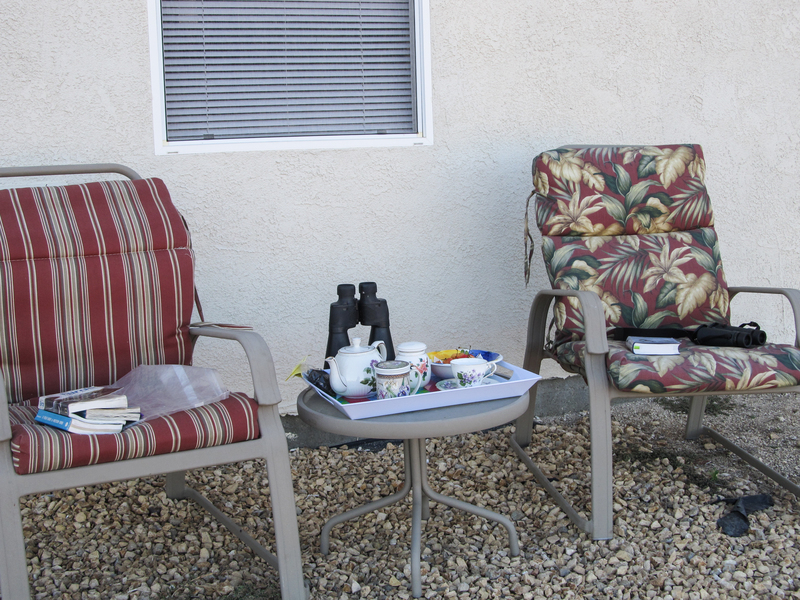 This is how we started Wednesday morning; tea, cherries, and birds! Beautiful, clear morning. The bevy of quail were having a grand time running all over. The mockingbirds were engorging themselves on Barb’s berries. I am so thankful that All She Wants To Do blogged about the Peterson Bird app sale. I’d been wanting it and $.99 was quite a deal. Whipped out the iPhone and turned on the app to check out several bird calls. It was so funny to hear the Gambel’s Quail call back when we played their audio. Tried to get the Kestrel to come back by for a visit and kept playing it’s call, alas, it was to no avail. Saw a new bird for my life list – a Canyon Wren. This beautiful song was floating down to us from the roof top right above, when we glanced up there was this small bird with a long beak. The Jimmy Durante of birds! It then flew to the rocks below putting on quite a show by climbing all over the rocks. Finally there was such a large ridicule of mockingbirds that all of the smaller birds were scared off. After a few hours the sun was high, the birds were gone so we decided it was time for breakfast. Barb whipped up a special, delicious Breakfast Sandwich. Cooked egg – break into hot pan, after the white is a bit solid, puncture the yolk so it spreads out and cooks. Slice of cheese – Barb used American. 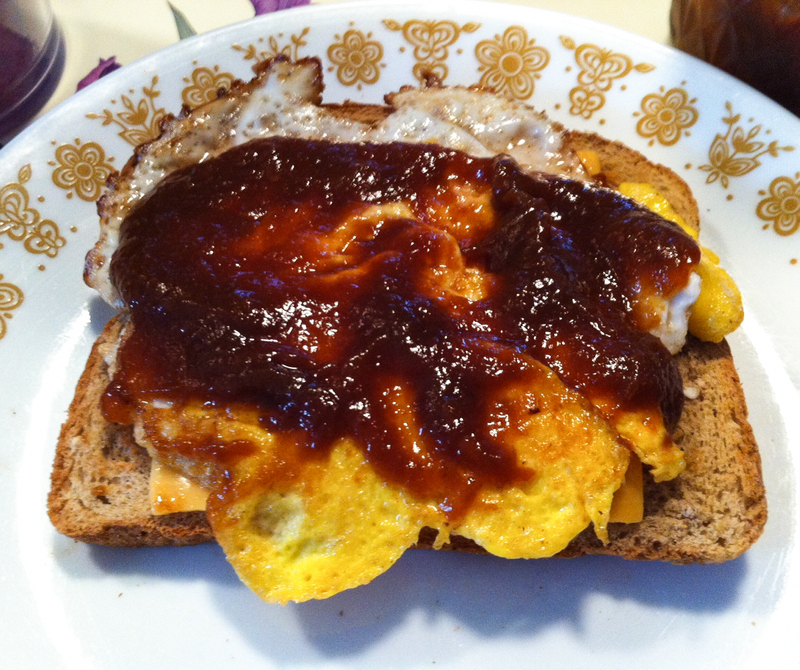 Toast the bread, top with the cheese slice, add cooked egg to the very top. Slather with Barb’s home-made Peach Butter! 😎 *You can still make the sandwich without peach butter. I’ve been wanting to cover compositions books. That’s the project I brought up for us. This is the craft area, we pulled out Barb’s kitchen table. The table was set up so we could watch our British mysteries while working. Sent a pic to the hubs and he said it looked as if a bunch of Kindergarteners had taken up residence! 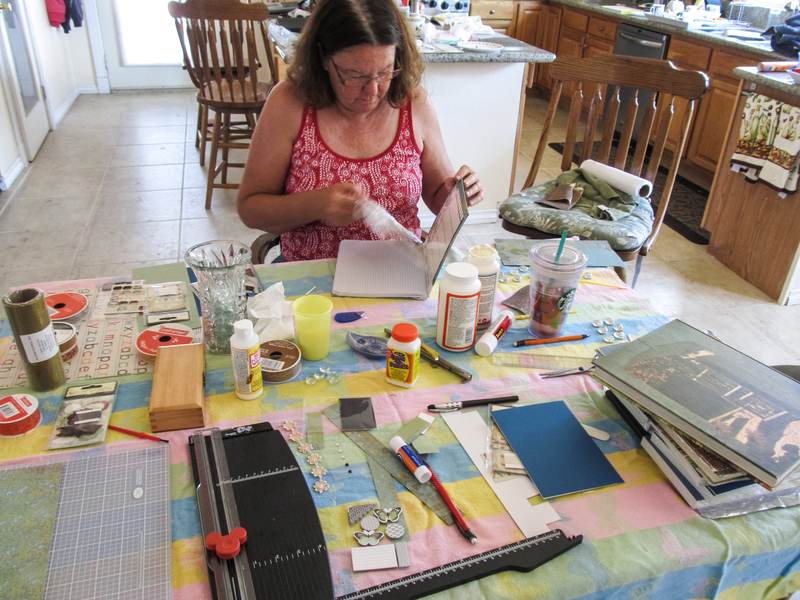 We’ll have a separate blog for our altered composition books AND the crazy project Barb had us do. 😎 Staples has the graph paper composition books on sale now if you want to get one and try the instructions we’ll be posting. Around The World With The Tea Spout Do-dad! 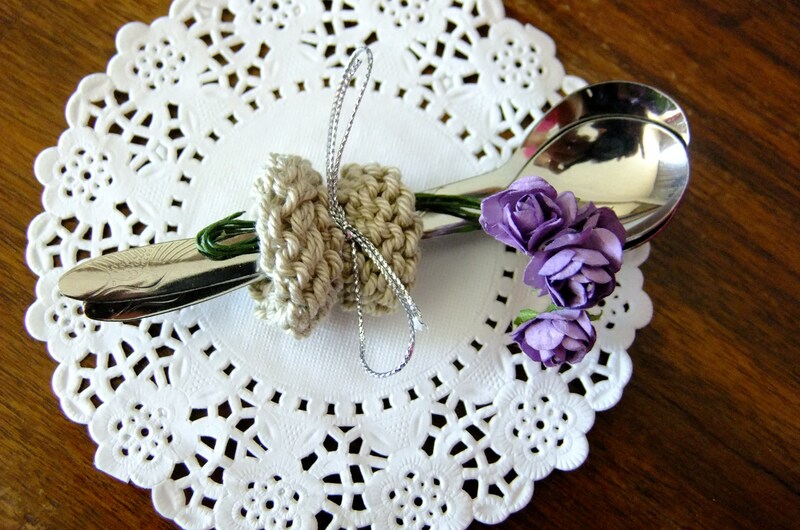 Sport weight yarn – you don’t need much, this is perfect for scrap yarn. I used wool, but cotton would work just as well. Cast off leaving a long enough tail to sew up side. I received a letter from Zillah asking for clarification of rows 4 and 5 so I have re-written those two rows hopefully making it clearer. She was making the do-dads for a tea party that was going to be given. I asked her to please send pictures! Yea! The tea party was held. Look at the clever presentation. She said they had a competition and asked the attendees what the do-dad was, “but no one knew”. 😎 She went on to say that one of the ladies used hers “when she had a tea-party the next day”. Thank you Bahrain. This bit of joy made my day! Isn’t this a brilliant idea? Maska av och lämna tillräcligt med tråd för att sy ihop arbetet. Barb and I celebrated my birthday together at AubreyRose. 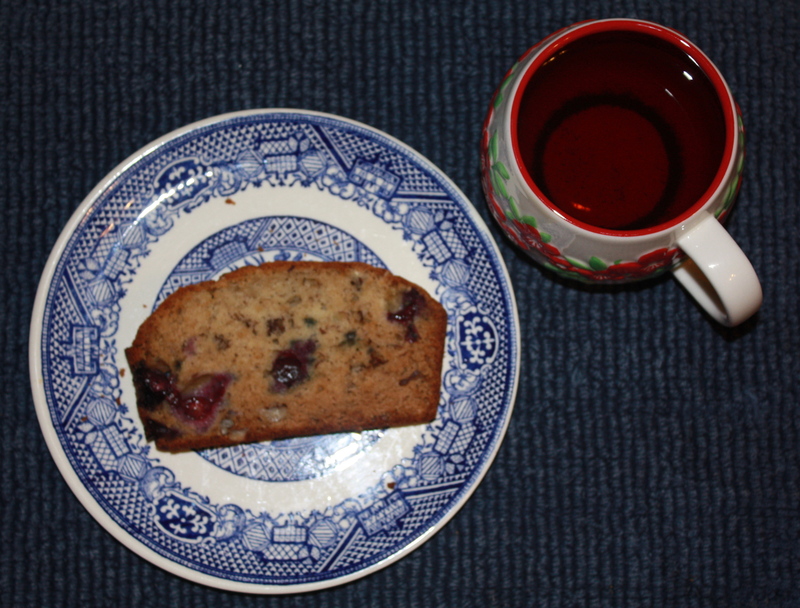 At home, I decided to have my own birthtea party! Hubs and Hans were not invited! I plopped a bag of Assam tea into the teapot and added hot water. Add a dash of honey, and it’s just lovely. I’m sure the violets were infused into the tea also, so delicious! Now, as a person of 1/2 Norwegian heritage I know I inherited the gene which has coffee flowing through my veins. I do love coffee. The other 1/2 is, as my southern dad always said, “Heinz 57”. That half inherited the love of ice tea (it’s ice tea in the South and iced for everyone else). From ice tea I grew to love hot tea. I have the best of both worlds! 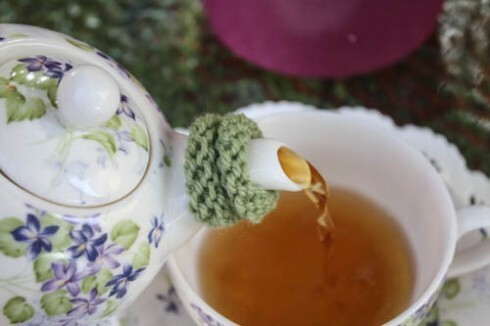 😎 Now I need to knit a lovely tea cozy! 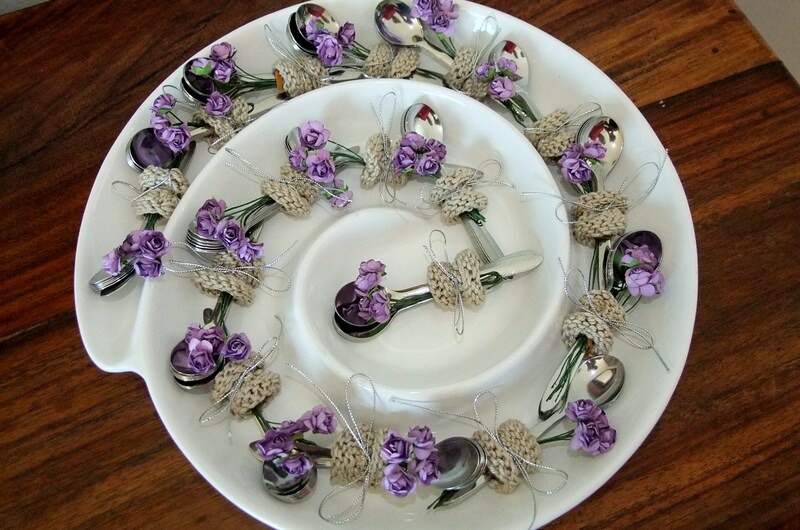 I have a special children’s tea set and have lots of tea parties with my grandkids when they visit. They know that the person who pours the tea is called “mother”. We do have a brilliant time! 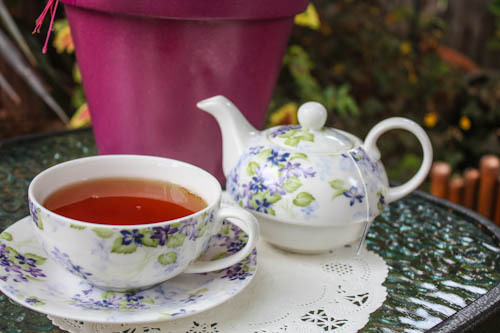 Take a break and join me in a spot of tea! 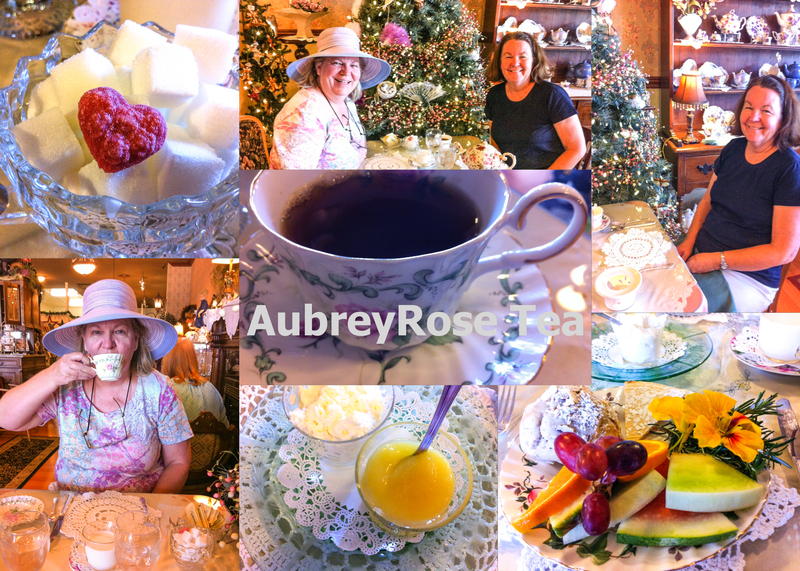 While out and about in La Mesa, Barb reminded me that we should again try to visit the AubreyRose Tea Room which always seemed to be closed when we go by. Hurray it was open! The shop is not only a tea room but sells a nice selection of teas, wonderful gifts and collectables. 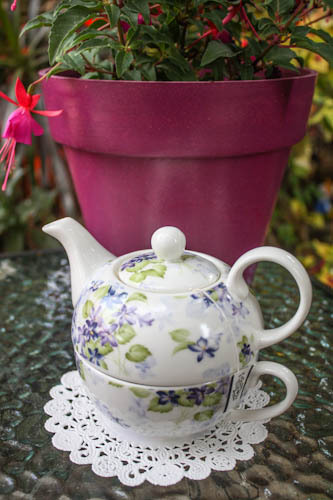 On our last journey into La Mesa, we window-shopped and saw some beautiful single service teapot/cup combos in the window. Our fingers were itching to see them close-up when the store was open. As we walked in, the glorious smells overwhelmed us and we had to stay for afternoon tea! What a delight. We had their lovely Cream Tea which is reserved for walk-ins. The Cream Tea includes: Fresh baked scone of the day, AubreyRose Cream, Lemon Curd, Tea biscuit, seasonal fruit garnish, and pot of tea of your choice. The presentation was quite beautiful and made us feel quite British! 😎 I really had to speak firmly to my little finger so it did not stick out while holding the tea cup. 😎 I LOVE the house tea, a black tea appropriately named AubreyRose. The delightful taste experience began with the water, which had a wonderful, light taste. When asked, the waitress informed me that they add a HINT of Lady Hannah tea to the drinking water. Lady Hannah tea contains roses and berries, yum! A Rocky Scone was served warm and with AubreyRose Cream and Lemon Curd. Lovely, just lovely! Look at that cute heart-shaped sugar cube. They even gave both of us large, cups of tea to go! Quite brilliant! It just so happens, that I had just purchased a new hat at another store only minutes before. Now, I need a new hat as much as I need a hole in my head! Saw it, it was on sale, bought it! Done! So I really do look the proper lady. Since it was a spur-of-the-moment idea, neither one of us had our cameras. I used my iPhone to take pictures, so the quality is not the best. 😎 We had my daughter Darcey’s bridesmaid tea at this shop. It really is a wonderful place. 😎 They do refer to their tea as a “two hour mini-vacation” and we whole-heartedly agree! Q – Whenever there is the slightest hint of black on the bananas, my husband, Alan, swears it’s time for me to make banana bread! I know he buys the bananas and doesn’t eat them on purpose. He says, “I bought them for you.” Yea, right! For me to make banana bread. I do have the best recipe in the world. I’ve used it since I was a child living at home with my parents, so I don’t have a clue which of my mom’s recipe books I got it from. Pillsbury? Betty Crocker? Two rotten bananas are staring me in the face and it’s cold outside, plus I have fresh blueberries. The next needs to be added and gently hand-stirred (more like folding) so the batter does not become “tough”. The flour should just get “wet”. When the flour is all “wet” add the nuts and blueberries, gently hand-stirring to add. Put into greased bread pan, cook at 350 degrees for 55 – 60 minutes. Use toothpick to see if bread is done. I have messed around with this recipe a lot! I’ve added different fruits, cinnamon, different nuts, etc. It always turns out great! Today I ran out of walnuts so I used pecans too. 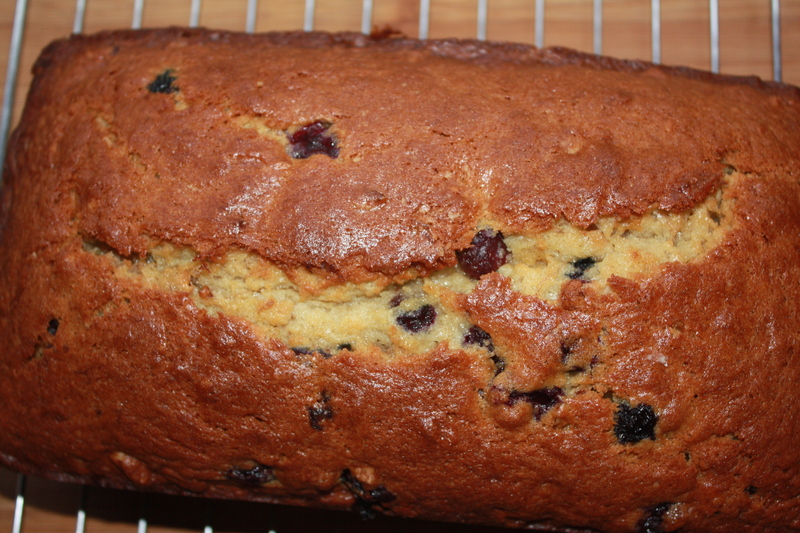 I make it without added fruit, such as blueberries, but I ALWAYS add nuts! It’s out of the oven now and cooling, time for a piece with cup of tea!! YUMMY! A taste explosion in my mouth! I’m dyeing inside today. I’ll share the adventure with you tomorrow.